Jeremy Couillard, Alien Afterlife (detail), 2016–17, mixed media, dimensions variable. 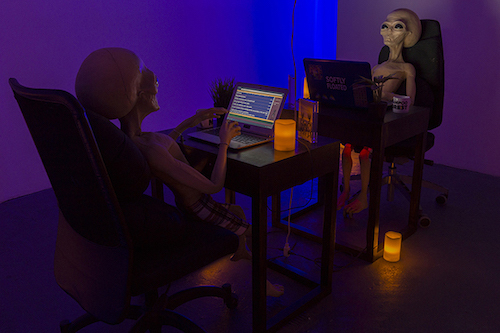 On a dusty, slate-colored couch reeking of bong water and dirty laundry, Jeremy Couillard invites visitors to experience a multidimensional journey into the great beyond with Alien Afterlife, 2016–17. The installation’s centerpiece is a video game designed and engineered by Couillard, unfurling as a quest for reincarnation amid kaleidoscopic landscapes and eccentric extraterrestrials. When the player is killed, the game abruptly ends with a stern and graphic “NO!” Moments later, you are returned to a limbo/home-base level called the Mother, sans penalty, likely because the character was dead to begin with. The whole virtual experience is suffused with the comic absurdity of early-1990s first-person-shooter games such as Wolfenstein 3D and Doom but carves its own unique position within the genre as a metacritique of dimensional reality.